Justin Hines is one of the coolest people I’ve ever met. Not because he’s managed to achieve so much musically while tackling Larsen syndrome and life in a wheelchair. And not because he is an inspirational person for showing the world that humans are limited only by what we convince ourselves is impossible. Hines is a cool cat for the same reason you might think highly of anyone else. He’s got style, he’s got class, he’s confident, and dignified. I spoke with Hines in May as he was about to embark on his Vehicle of Change tour, an uplifting jaunt around North America that is raising money to assist people with disabilities. He is articulate, humble, and clearly devoted to maximizing his musical talent. Hines has used his celebrity to make societies look anew at the power and positivity of the disabled, but his advocacy isn’t a political or an overwhelming part of his message. Instead, he’s considerate about how the world operates and is aware that accessibility isn’t always at the top of mind. Like most musicians, Hines is focused on his career more than anything else. His latest album, “How We Fly,” was released this spring and showcases that extraordinary voice of his, a deeply human and expressive vocal gift that catches your ear before you notice the body from which it comes. There’s no denying that Hines’ disability makes people curious about him, but it’s also clear he’s long over being recognized for the challenge he’s overcome and we should move forward too, focusing on his talent and how that’s evolved. The latest single, “Lay My Burdens Down,” is a bluesy treat that breaks away from some of Hines’ more mellifluous songs, like “Please Stay” and “Say What You Will.” It displays maturation in his style and also some angst that makes the song dramatic. When Hines lets his voice loose it is riveting and songs like “Lay My Burdens Down” allow him to show off his chops. By its nature, roots music makes a statement through understatement. It uses poetry and art and subtlety to snake its way into a groove that listeners find themselves wanting to retrace time and again. If rock ‘n roll and hip hop are the Saturday night club, then roots and folk music are the neighbourhood coffee shop — the place we always wind up when we want to think and gain perspective and sense community. Tom Wilson may look like Saturday night — and he’s no doubt enjoyed the rock lifestyle — but his songs have always had the elements of folk music, from their melodies to their characters who possess the depth necessary to connect a listener with their struggles. 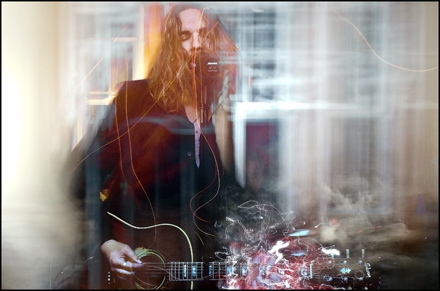 On “The Folk Sinner,” the sophisticated second album by his Lee Harvey Osmond project, Wilson shows he’s at his finest these days when there is minimal bombast. With the goal of “serving the music first,” Wilson and his bandmates deliver an elegantly produced album with throaty vocals and a touch of First Nations texture in songs like “Big Chief.” It is reminiscent of Robbie Robertson’s brilliant self-titled album from 1987. “The Folk Sinner” also evokes another celebrated Canadian songwriter, Gordon Lightfoot. A cover of his song “Oh Linda” kicks off the album and was a highlight of Friday night’s performance inToronto that featured Wilson and several of his friends, who just happen to be among Canada’s most talented musicians. Wilson’s Blackie and the Rodeo Kings bandmate Colin Linden performed “Oh Linda” while Michael Timmins of the Cowboy Junkies, Oh Susanna, the Skydiggers‘ Andy Maize, and Paul Reddick were also on stage at the Great Hall for a 90-minute set that showed folk songs have no problem turning into rock music when infused with the energy of a live show and Wilson’s showmanship. “That configuration has never played together before. They’re all friends of mine and have been for a long time. The idea was to serve the music, to put it first and see where it takes us,” Wilson told me on Tuesday. A charismatic frontman, Wilson keeps audiences engaged with his humour, some of it self-effacing (“I’ve been on a no-wheat diet and I’m trimmed down and feeling good, but before the show I had a burger for the first time in months and I tell you, I owned that bun, man”), and talents, whether with his vocals or his on-stage antics. On “The Folk Sinner,” “Freedom” is a funky foot-tapping number highlighted by horns and slide guitar, but in concert it smoulders. With a riveting and fiery delivery, Wilson urges anyone within earshot to unshackle themselves and move. Timmins’ sister, Margo, will be making appearances on upcoming tour dates, Wilson said. Hawksley Workman, who performs on the album’s first single, “Break Your Body Down,” will also join this rambling group of aging and congenial musicians who will show audiences that great concerts are still about great musicianship, not distracting choreography and lip-synching. Diamond rings, John O’Regan says, are glamorous and tough. That’s why they’re the namesake of his on-stage persona, an act that has busted out of the Toronto music scene to earn superlative-laden reviews across the continent. One reason for the success is the fact diamond rings are mesmerizing too. It’s difficult not to keep your eyes on O’Regan. For one thing, you have to make up your mind whether his act is an artistic form of self-expression or a schtick. One listen of his hit “I’m Just Me” should convince you he’s much more Ziggy Stardustthan Gary Glitter, which is to say that Diamond Rings has substance and cred. It’s quite possible the persona O’Regan has created is the most interesting act to come out of Canada since Arcade Fire. “I’m Just Me” comes across as a mantra for the sexually uncertain, the androgynous or the transgender, but like any great song it has universality to it, appealing to anyone who embraces their individuality when it clashes with bullies or the sensibilities of the establishment. There’s both a rebelliousness and a sweetness to the song, underscoring the duality O’Regan talks about in himself and his performance. While most audiences are now hearing about Diamond Rings for the first time, O’Regan isn’t an overnight success. He’s been toiling in Toronto for several years, fronting the electro-pop band The D’urbervilles, recently renamed Matters. In Toronto, the 27-year-old spends his days in Roncesvalles, a historic neighbourhood known for its Polish heritage and proximity to High Park. “I tend not to leave that neighbourhood when I’m at home. Being away, being in a rock band there is so much stimulation, a lot of long nights, a lot of loud music and loud clubs, and although Toronto is great for all that stuff, when I’m home it’s rarely what I want to do,” O’Regan said during an interview three weeks ago in a suite in the Ritz-Carlton Toronto. Roncesvalles is beyond West Queen West, an area that’s become a cultural hub for the city, with vintage clothing stores, nightclubs, and a pair of notable boutique hotels, the Gladstone and the Drake, that are a breeding ground for artists of all sorts. O’Regan’s part of town is much more low key, although it does have two of the city’s best new restaurants in Hopgood’s Foodliner and Barque. Despite his flamboyant stage presence, O’Regan struck me as very much an introspective artist devoted to pushing himself and his work as far as he can, and that makes Roncesvalles a fit for him. It lacks the bustle and distractions of other areas of the city, allowing him to hole up and make music. CALGARY, ALBERTA — In “Alberta Bound,” Paul Brandt sings about the province’s “black fertile ground” and “big, blue sky” in an ode to the beauty of his home. The tune could be a contemporary anthem for Alberta, one that would fit hand-in-hand with Ian Tyson’s “Four Strong Winds.” For the songwriter, though, “Alberta Bound” is a travel song. Brandt notes that its lyrics held significance for him while he was away from Calgary, touring the world and living in Nashville for almost 10 years. During an interview with Vacay.ca last month, Brandt called “Alberta Bound” a song “that has defined my career in a lot of ways.” Its inspiration came from the drives he would make during the Christmas holidays, travelling from Nashville back to Calgary. “The seeds for that song were planted during that time. We would always hit the Sweet Grass sign at the Montana border and we knew we were getting close to home and that made it into the song,” Brandt says, noting the song’s opening lyric that speaks of being 40 miles from Canada, a sentiment reminiscent of many road-trip tunes from this country, including “Last American Exit” by the Tragically Hip and “Coming Home” from City and Colour. Recently, Brandt’s work has kept him home, to his delight. He headlined the “Century” Grandstand Show at the 100th Calgary Stampede, teaming with a roster of international entertainers to thrill attendees with theatrics and song. With that undertaking complete, he returns to recording and touring. His new album “Just As I Am” is due out in the fall and a cross-Canada tour will follow its release. The country music superstar rose to prominence in 1996, earning Top New Male Artist of the Year honours at the CMT Awards. He has racked up eight Juno Awards during his career and has received more accolades than any male Canadian country singer — and he only recently turned 40. Brandt’s success has taken him around the world and also led him right back to where he started. An avid fisherman and marathon runner, Brandt revels in the many outdoor activities that Albertans enjoy, whether it be hiking the Rocky Mountains or taking in the scenic trails around the province. He and his wife, Elizabeth Peterson, chose to raise their family in Canada rather than Tennessee, which is why they returned north. Casey Gibson’s first time to Toronto came in March during a record heat wave, made all the more intense by Filligar’s performances during Canadian Music Week. Gibson and his bandmates from Chicago returned two weeks ago to find the city basking again in sunshine and the electricity of a music festival. TORONTO, ONTARIO — Before this year, JT Stevenson hadn’t walked into the Royal Ontario Museum since he was 13. Back then, he had to leap to reach the hook to hang his coat. These days, Stevenson is grown up and back at the ROM every Friday night. 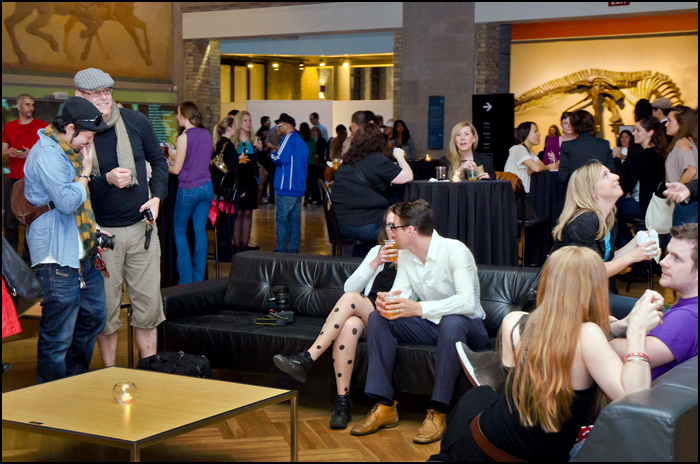 The hooks he’s concerned about are the ones his DJs spin during the museum’s immensely popular Friday Night Live series, a weekly mashup of food, music, drink and some of the most valuable artwork in the country. Stevenson was at a recent event that coincided with the CONTACT photography festival. Along with the DJs, pop-up food eateries such as Jamie Kennedy’s Frites, an Asian noodle shop from c5 and popular Cuban sandwich company Fidel Gastro set up stations in the corners of the museum’s main lounge area. A bar in the lobby pours out wine, beer and spirits, while tellers sell ROM Bucks, which look like strips of amusement-park tickets. They have to be used to purchase food and beverages because the food stations and bar aren’t stocked with change. The chefs also have restrictions on what they can serve. That limitation hasn’t hurt Basile, though. Lineups for the three sandwiches he does offer at the ROM — including a mac-and-cheese with pork and a delicious shredded butter chicken number — stretch into the dozens and he said he was sold out by 9 pm during the May 4 event. Friday Night Live starts at 6 pm and runs until 11 pm, 90 minutes after the museum’s doors close. The concept of turning museum space into a playground for adults isn’t new. Buenos Aires has held Museum Nights for years, where music and tango dancing take over many of the city’s art spaces, while New York, Rome and Paris have long had evenings where iconic museums morph into something resembling a disco. This type of ongoing series is new for Toronto — and Canada — and it’s been a bona fide hit from the outset. At 8 pm, lineups to enter the ROM look like what you’d find near 11:30 on club night in the Entertainment District. Those who attend — the demographic is perhaps broader than any event in the city other than the Toronto International Film Festival — get the opportunity to visit the museum’s galleries and exhibits, which continue as they would on any other night, with volunteer guides to answer questions and give information about topics like the eyesight of birds and the blinding effects of tarantula hair. Since the inception of Friday Night Live, the guides have noticed some tipsy patrons and once a stickbug — a tiny insect with delicate appendages — lost two legs while being held by a guest who wasn’t prepared for the crawling creature’s fragility. “But it’s okay, their legs can grow back,” the guide said. 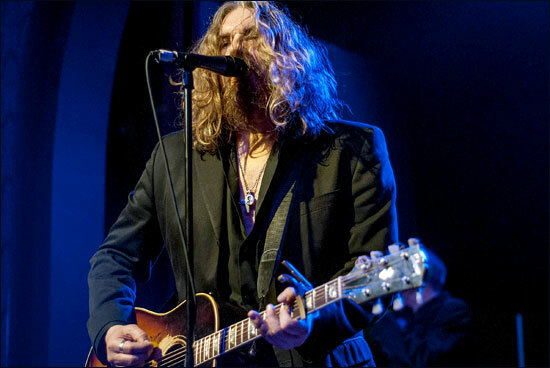 On March 21, Tom Wilson headlined at Massey Hall in front of 2,750 fans. Less than three weeks later, he is tuning his guitar in the living room of a home in a middle-class neighbourhood in midtown Toronto, about to play to 31 people, many of whom can’t believe their fortune. The performance that ensues gives new meaning to bringing down the house. Wilson doesn’t hold back anything, either. The singer/songwriter with a wide range of tunes plays for an hour, including a two-song encore that starts with a cover of “Ring of Fire.” His voice resonates with clear, dead-on pitch like what you might be treated to in a studio session. As always, his showmanship is as much a part of the entertainment as his music. His self-effacing comments and hilarious stories of rock ’n roll life never fail to win over a crowd. During this set on Good Friday, Wilson reveals that Colin Linden nearly showed up, too. Linden, Wilson and Stephen Fearing form Juno Award-winning Blackie & the Rodeo Kings, who finally headlined a gig at Massey Hall after 15 years together. Although it would have been a great bonus to see Linden, the audience is more than satisfied with Wilson and his band members, who on this night include his son as well as long-time collaborator Ray Farrugia. The trio are paid with the money brought in from ticket sales. One of the owners is from Mexico and apparently spoils the band with fabulous cuisine prior to the show. The homeowners, who will remain anonymous because operating a “concert venue” out of their house may not fly with some authority figures, also offer bed-and-breakfast stays to the musicians.